A dark yet exciting near-future awaits! Publisher's blurb: "The Solar System is a roaring mayhem of death and war. The surfaces of the inner planets have been swept clean by the violent onslaught of the Dark Legion's storming hordes of Nepharites, Necromutants, Razides, Pretorian Stalkers and Undead Legionnaires. In the enormous cities of the dark and distant future, Heretics devoted to the destruction of humankind stalk the dark backstreets and gloomy alleys spreading their teachings of greed, jealousy and war. 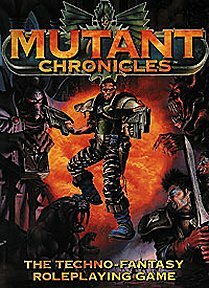 "The Mutant Chronicles RPG brings you a spectacular techno-fantasy setting where you are the Heroes. Within the covers of this book, you will find all information necessary no matter if you want your adventure to take place in the shadows of Luna's skyscrapers and cathedrals, the putrid jungles of Venus, or the hostile deserts of Mars."